Thrill to the magic of Morgan & West in Worthing! Magicians, time-travellers and “all-round spiffing chaps” Morgan & West bring two shows to Worthing. Fresh from their appearance on CW Network and Netflix’s Penn & Teller: Fool Us and packed houses in Beijing, they are touring the country with their critically-acclaimed show Parlour Tricks and an Utterly Spiffing Spectacular magic show for kids at Worthing’s Connaught Theatre on Saturday, November 10. In the afternoon at 2pm, their Utterly Spiffing Spectacular Magic Show For Kids (and Childish Grown-ups) promises “a mountain of mysterious magic, a hatful of hyper-reality, and of course a truck full of tricks and tea”. Mixing brain-busting illusion and good old fashioned tomfoolery, Morgan & West present a show for all the family, with magic and silliness. Spokesman Stephen Sheldrake said: “Despite their squabbles about the idea of creating a show for children (one of these distinguished gentlemen can think of little worse than performing to anyone under 21!) our favourite old-time magic duo set out to provide entertainment that really is thrilling for anyone of almost any age, from any time period (anyone else born in 1865 would be especially welcome! ), and any level of maturity (or should we say, immaturity?). “The result is a wondrous show that is loved by adults and children alike, as Morgan & West unload another boxful of bafflement and impossibility. “Following this, the duo will present their Parlour Tricks at 7.30pm, where you can expect a thoroughly-entertaining, utterly-baffling and endlessly-enthralling evening, absolutely chock full of brain bursting illusion and impossibility, all topped off with a touch of time travel, this dashing duo of deception vow to astound and enthral with their most perplexing show to date. 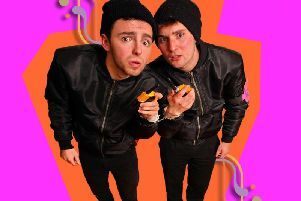 “After performing at festivals across America and the UK the dashing duo are returning to their roots; the theatre. Bringing together jaw-dropping, gasp-eliciting feats of magic served with wit, charm, and no small amount of panache – Parlour Tricks celebrates the eclectic and enticing aspects of the golden age of magic and variety.